You can check out the 5-day challenge for beginners here. Prepping is a lifestyle, not a hobby. 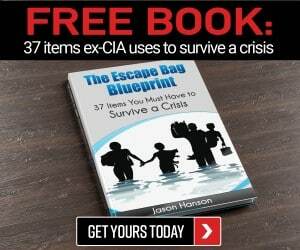 Even the most advanced preppers among us realize they do not know everything there is to know about SHTF preparedness and are always on the lookout for great prepper projects and enhancements to their survival skills set and prepper retreat. These projects offers the chance for all of us to do what we yearn to do – become the most prepared we can be for a doomsday disaster! Can you survive (and thrive) the 5-day challenge for advanced preppers? Cooking over an open flame is fun when camping, but can be daunting when preparing full and daily meals during a long-term disaster. 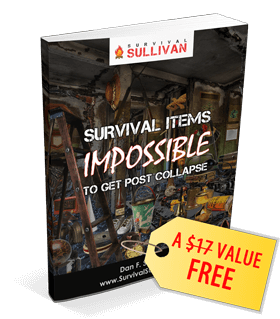 While you cannot regulate the heat easily and exactly when cooking over a fire pit, on a charcoal grill, or with a survival cooker – but practice will make nearly perfect and allow even a novice prepper to prepare safe and tasty meals over a fire or on a survival cooker. Rocket stoves heat up quickly and require very little tinder or kindling for fuel. You can buy a quality small rocket stove for as little as $100, but making your own a lot cheaper – and doing so helps the user to better understand how the stove functions, improving the odds of not burning or dangerously under-cooking any of your precious food supply. Rocket stoves are fueled by small amounts of lightweight timber, but are yet capable of bring water to a boil rapidly. Typically, you will not need more than about five small twigs to boil water or cook on this type of survival cooker. A metal cutting tool like a pair of tin snips or a Dremel. Three 10 to 28-ounce cans. The interior cooking liner on all cans of Bush’s Baked Beans make them an excellent choice for this project. Hammer, drywall nails, a hole punch, needle nose pliers and some scrap pieces, about 10 inches long, of bendable small gauge wire. Black or camo color high heat-tolerant spray paint – this step is optional but it helps prevent a shiny metal can from reflecting the light of the sun and pin-pointing your position from possibly miles away. Using the lid removed from the 28-ounce cans, trace its shape onto the #10 can, or larger can you are using to make the rocket stove. The bottom of the circle traced from the lid should be drawn about a finger’ width from the bottom of the can. Using your chosen cutting tool, snip the traced shape away from the large can. Remove both the top only from one of the smaller cans and then removed both the top and bottom from the remaining third small can. Using the small can with both the top and the bottom exposed, slide it into the hole in the #10 can so it sits half-way inside. This will be a very snug fit, you will have to push hard, but do not use the hammer, it will damage what will be used as the feed chute on the rocket stove. Now, remove the feed chute can, pulling firmly yet gently, and trace the outline of the can’s opening onto the side of the second small can. The traced circle must be placed near the open top portion of the second can – it will function as the burning chamber. The feed chute can will hold the burning chamber can in place after it is placed back inside the large can. Using the third small can, the one with the top and bottom already removed and cut vertical slits from top to bottom. This can will function as the chimney stack for the rocket stove. Trace the opening of the chimney chute can onto the lid of the large can. Cut the opening and slide the chimney chute can into the so it rests just inside the large can. Pour your chosen insulating material into the large can, making sure it packs firmly around the feed chute can. Fill the large can up to its rim and pack the material down firmly with your hand. Put the large can lid onto the top of the rocket stove. Using a hole punch, hammer and nail or other chosen tool, make holes around the top of the large can and use wire to secure the lid and can firmly together. Watch how simple it is to build a rocket stove! The carbon found in activate charcoal does not remove all of the minerals and salt content in the water, but it does have the power to strip chlorine and potentially deadly organic matter from the liquid. Homemade charcoal water filters can be made on a small and portable level by using a plastic water bottle, or on a grander scale using a food-grade plastic barrel. Crush the cooled activated charcoal into small pieces – they should resemble small pebbles or the gravel found in fish aquariums. Using a clean plastic barrel or plastic bottle, cut off the bottom making both ends of the container now have an opening. Through the small opening of the bottle or the top of the barrel, push either relatively clean grass, hay, straw, or cloth inside until it is packed firmly. The filtering material should fill approximately one-fourth of the container. If the cap of the bottle is still handy, poke a small hole into the middle of it to help keep the packing material inside even better. Now, using even and firm pressure, push the crushed charcoal inside the water filtration container. The water will now have to flow through the charcoal, stripping it of organic contamination and chlorine and then once again through the other packing material to remove any larger matter. The charcoal layer should fill the bottle half-way full. When pouring water inside the container to filter away impurities, do so slowly to allow the activate charcoal time to work. Once again add a layer of clean grass or any of the clean material noted in step 3. Fill the bottle to the very top and replace the cap if it is available. The time it takes for the water to work its way through the filtration will depend greatly upon both the size of the container used and the quality of the water being used. If possible, have a second clean container handy to pour the filtered water into and then run the cleansed water back through the filter a second time. The activated charcoal can typically be used multiple times depending upon the quality of the water – but use fresh charcoal as often as possible. Once the water has been filtered through the activated charcoal container once or twice – or even three times, it is now time to boil the water to remove yet more impurities. Slowly pour the filtered water into a cook pot, being careful not to disturb the filtering layers any more than absolutely necessary. Shaking the container too much could allow the dirt and impurities in the water to dirty the water once again. Bring the water to a full rolling boil and keep it at boiling temperature for at least three minutes. Allow the water to cool before drinking, this could take up to 20 minutes. If the filtered water is being used for emergency survival medical purposes, like sterilizing bandages or equipment, do not allow the water to cool – it will have less disinfecting potency. Smoking meat, fish, and poultry gives it a delicious taste, it is also an age-old manner in preserving essential protein. Building a smokehouse out of pallets is not a difficult project if you are at all handy with power tools and can will only cost about $75 to $100 – less if you score free pallets! Before you start to make the 4-foot by 4-foot pallet smokehouse with a firebox attached to the side of the structure with a 4-inch pipe, you will need to clear an area around the chosen space to reduce any potential fire hazard. Stand the pallets up on the ground so they form a “U” or open square shape. The pallet smokehouse will resemble an old-fashioned outhouse when the project is complete. Secure the pallets together with 3-inch decking screws. To build the second “floor” of the smokehouse you will need three more pallets to form the same open square shape and an additional pallet to deconstruct for wood strips to secure the second row to the first row of pallets – or any scrap wood you have on hand cut to fit. Using decking screws again, secure a board to the top edge of one of the pallets on the first row – it must be screwed into place so there is enough room left for secure the same board to the second row pallet to be secured directly above the first row pallet it sits upon. Repeat step four until there is a complete second row sitting securely on top of the first row of pallets. Top make a roof, use either another pallet, or scrap piece of wood, screwed onto the second row of pallets at a 30-degree angle. Measure and cut or purchase corrugated tin metal roofing or pole barn construction material to fit on the side pallets and the roof – the metal will be your finished sides and will protect the pallets from the elements and keep the heat from escaping the smokehouse. Screw the metal siding into place using decking screws. To make a front with a door for the smoker, cut a piece of metal roofing cut to fit the entire front in half. Secure each halve to the smokehouse using two hinges on each door – place them near the top and bottom of the door. Drill holes to secure door pulls to the metal so it can be pulled open, buy mounting hardware which will hold a 2X4 to slide in and out, or swing up, to allow access and closure, or simply screw several pieces of scrap wood so they can be slid up or down to and out of the way to allow the door panels to swing free. Drill a hole into one side wall of the smokehouse so a 4-inch pipe can be run outside and be connected to a firebox to heat the smoker. You can purchase a firebox at an outdoors store, or do a bit of research and learn how to make an inexpensive one using cinder blocks and a sheet of metal for a damper to control the temperature, a metal barrel, or even a metal #can for a small smokehouse. There are many, many ways to build a smokehouse out of pallets, this is just a relatively simple, 1-day project I helped complete and I know works great. Extend your growing season and produce more food for the family by using a cold-frame greenhouse. 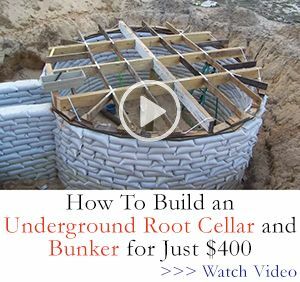 This project costs about $100 to make – unless you have plenty of scrap materials laying around like my packrat prepper of a husband, then it is entirely free! Cold-weather crops such as broccoli, potatoes, carrots, scallions, and spinach thrive in cold frames. I have also successfully grown lettuce and started my tomato seeds inside our cold frame. During the summer months, I turn the cold-frames into solar dehydrators for our medicinal herbs and also use them as solar ovens for baking bread. Only a few minor and temporary adjustments to the bottom of the cold-frames to prevent bugs from crawling out of the ground and eating all of the goodies. I simply place a piece of metal sheeting on top of the dirt after the plants have been removed. The metal reflects and retains heat as well as serves as a barrier for creepy-crawlies. This cold frame will give your about 25-square-feet of growing space You can make a single, or multiple cold-frames to just about any desired size. If you time the project just right, you can let the cold-frame double as a brooder, perhaps even an incubator, and allow hatchling chicks and ducklings to roam about inside and provide excellent fertilizer for the dirt inside. If it is not the right time of year to use the cold-frame as a brooder, you can prep the ground naturally by using it as a compost bin. The natural heat generated inside the cold-frame will enhance the break-down time for the matter in the compost pile and once again, provide essential nutrients for the crops which will one day get their start growing inside. Hinges to secures the windows or SNUTUF panels store-bought materials for the cold-frame project. Sealant, either in tape or silicone caulk form if problems with firm fitting of boards arise or simply for extra protection against the elements. Tools: power drill, circular Saw, tin snips, Philips head driver bit and a ¼-inch driver bit, a chop saw might also come in handy. If using SUNTUF panels, cut each one of them in half so you have four pieces that are 48-inches long and 26-inches wide. You can leave the panels as a solid piece, but this will likely enhance sagging and make it more difficult to lift without bowing and to prop open when tending to the plants. The panels can easily be cut with either tin snips or a circular saw. The panels work great, but I believe glass works better and that is what I used since we had a plethora of old windows to upcycle. Lay the panels onto the ground so they overlap – the curved rib of one panel should lay snugly on top of the curved rib of an adjacent panel. The panels will be the lid of the cold-frame. Miter cut the ends of two of the 8-foot 2×2 piece of lumber. The cuts should be made at a 45-degree angle, as if you were making a picture frame. If mitering is not your thing, you could also simply use small screws after cutting the boards to size and attaching them on top of the curved panel pieces on all sides. If you window frames, this step is not necessary. Attach mitered board corners together using 1-5/8-inch screws. Cut the remaining 2X2 board so it is about 93-inches long. It will serve as the center of the cold-frame. It will be placed about 2-feet from both the top and bottom corners – making it a horizontal support beam that runs parallel to the long sides of the cold-frame and will prevent the roof panels from being weighted down by snow. If using sealant, place it at the seams of the lid after it is attached to the wood frame. Make the cold-frame base by screwing the 3-foot long boards to form side panels for the 8-foot long boards which serve as the front and back panels. If dividing the cold-frame into sections, and to add additional support for the lid, 3-foot long boards can be screwed onto the inside of the cold-frame base at desired spots – screws the support/divider boards to the inside front of the frame BEFORE attaching the sides or back, if going this route. Stockpiling guns and ammo is always near the top of any preppers “to do” list, but there are others weapons you can make at home to help defend the family. Long bows made simply out of PVC pipe are sturdy and have been known to nicely put down a deer! Since you can craft you own arrows out of feathers provided by members of your flock and shaved twigs found around the homestead, PVC bows should be valued as an excellent sustainable low-tech weapon. Bow string -about 50-60 inches should work perfectly. Tools: metal file, hacksaw and a power drill with a one-eighth-inch drill bit. Optional: if you want to be stealthy, get some spray paint designed for plastic materials to spray the white PVC pipe black or camo colors. Place the ½-inch thick PVC pipe on a work table and stretch a piece of masking tape across the center from top to bottom, firmly pressing it into place. Place another piece of masking tape across the center of the opening of one end of the PVC pipe. Use the permanent marker and place an “X” to mark the center of the tape across the opening to mark its diameter. Draw a line from the “X” on top of the masking tape placed down the center of the pipe – make sure to draw a straight line all the way down to the other end of the pipe. Follow your markings on the tape to cut the pipe in half using the hacksaw. Spray the inside both of one of the cut pieces of the pipe with the WD-40 until it is thoroughly coated from top to bottom. Lay the other cut piece aside until later if when you make more bows. Slide the oiled cut piece of pipe into the uncut piece of three-fourths of an inch pipe. Make sure the cut piece is placed completely inside by gently, yet firmly, pushing the pipe against the table or ground – don’t push too hard or you can crack either or both pipe pieces. Grab the marker and measuring tape again. Measure and mark a spot ¾ of an inch from the opening on each end of the uncut piece of pipe. The measuring marks should be placed on the same side of the uncut piece of pipe. Drill a hold over each mark. The hole must cut through both the cut and uncut piece of pipe. Cut the top of each hole open with the hacksaw and sand or file away any rough edges in and around the opened holes. The notches made will create a holding slit for the bow string. Make a handle in the center of the long pipe using the pipe insulation. Wrap the insulation around the middle area of the bow until it feels like a comfortable and sturdy spot for hand placement. Secure the insulation onto the bow using the duct tape. You will need to wrap the tape around the insulation four or five times. Wrap the fiberglass rod in a layer each of electrical and duct tape. Slide the rod inside the PVC pipe. This will add both weight and stability to the homemade PVC pipe bow. Slide the string onto the notches so it is tight, but not too tight to pull without snapping. Knot it into place several times. Cut off any excess string. The 5-day challenge for advanced preppers offers projects not just for a single day, but for durable use during a survival situation. Don’t forget to cross-train other loved ones and mutual assistance group members so they too can hone their preparedness skills and be far more useful when disaster strikes!